TEPSA has recently coordinated a study for the European Parliament Committee on Foreign Affairs, authored by Pål Wrange (Stockholm University, Stockholm, Sweden) and Sarah Helaoui (for Section 5.2). 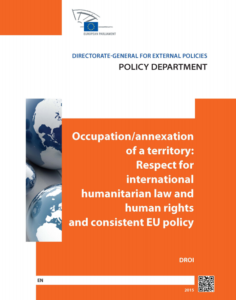 Situations of occupation are often among the most difficult conflicts to resolve, in particular if the occupied territory is also illegally annexed. Legally speaking, an illegally annexed territory is occupied. Third parties (like the EU) have an obligation to not recognise an illegal annexation and to not assist in the continued occupation and annexation. An occupying power has limited authority over the occupied territory under international humanitarian law (IHL), but has nevertheless an obligation to respect not only IHL but also international human rights law. The EU has so far not adopted a consistent policy in these cases, but there are elements of good practice that can be used. A future EU policy should be based on non-recognition – as has been the case with regard to Crimea. The EU and its member states should refuse to recognise legislative and other changes in the occupied territory, they should refrain from engaging in economic and other activities that sustain the occupation and they should seriously consider sanctions against the responsible government.